Clarice Bean meets Finding Dory in this laugh-out-loud diary set under the sea! Darcy Dolphin and friends are back for some more underwater adventures! In the third book of the series Darcy joins the Sea Trouts, whose motto is 'Lend a Fin'. But Darcy's attempts to be helpful don't exactly go swimmingly... and soon there's chaos at the pet exercise class, an extremely grumpy resident at the Retired Sharks home and a plankton on the run! 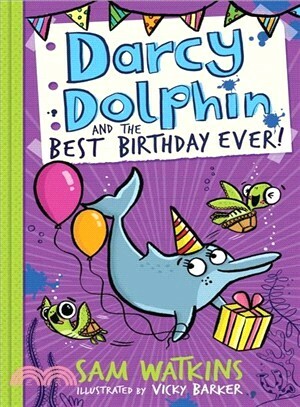 Can Darcy sort it all out and still have time to throw Ozzie Octopus the best birthday party ever? The third in a brilliantly funny new illustrated fiction series for boys and girls aged 6 years +. Perfect for fans of The Unbelievable Top Secret Diary of Pig by Emer Stamp, Barry Loser, the Wigglesbottom Primary series by Pamela Butchart and the Daisy books. Sam Watkins has worked as a bookseller, editor and publisher, and is now a full-time children's books writer and illustrator. She is the author of the Creature Teacher series with OUP, as well as Nick Knight: Super Sub! and Puss in Football Boots, both published by Franklin Watts. Creature Teacher was shortlisted for the Heart of Hawick Children’s Book Award in 2016. Sam lives in Worthing with her family and a yellow campervan named Daphne. Vicky Barker is a freelance illustrator, designer and art director based in Liverpool. She has worked on a variety of books, including the Fish Fingers series and The Catsup High Detective Agency for Catnip Books, and a series of activity books for bSmall. Vicky loves doodling new characters and is partial to a bit of screen-printing in her spare time.